PERTH, Australia (AP) — Search crews have failed to relocate faint sounds heard deep in the Indian Ocean, possibly from the missing Malaysian jetliner's black boxes whose batteries are at the end of their life. Angus Houston, the retired Australian air chief marshal who is heading the search far off Australia's west coast, said sound locating equipment on board the Ocean Shield has picked up no trace of the signals since they were first heard late Saturday and early Sunday. The signals had sparked hopes of a breakthrough in the search for Flight 370. "There have been no further contacts with any transmission and we need to continue (searching) for several days right up to the point at which there's absolutely no doubt that the batteries will have expired," Houston said. If, by that point, the U.S. Navy listening equipment being towed behind the Ocean Shield has failed to pick up any signals, a sub on board the ship will be deployed to try and chart out any debris on the sea floor. If the sub maps out a debris field, the crew will replace its sonar system with a camera unit to photograph any wreckage. Houston's comments contradicted an earlier statement from Australia's acting prime minister, Warren Truss, who said search crews would launch the Bluefin 21 autonomous sub on Tuesday. A spokesman for Truss said the conflicting information was a misunderstanding, and Truss acknowledged the sub was not being used immediately. The towed pinger locator detected late Saturday and early Sunday two distinct, long-lasting sounds underwater that are consistent with the pings from an aircraft's black boxes — the flight data and cockpit voice recorders, Houston said. "This is the most positive lead, and rest assured we are pursuing it very vigorously," Defense Minister David Johnston said. Still, officials warned it could take days to determine whether the sounds were connected to the missing plane, which vanished March 8 on a flight from Kuala Lumpur, Malaysia, to Beijing with 239 on board. "This is an herculean task — it's over a very, very wide area, the water is extremely deep," Johnston said. "We have at least several days of intense action ahead of us." Houtson said finding the sound again was critical to narrowing down the search area before the sub can be used. If the vehicle went down now with the sparse data collected so far, it would take "many, many days" for it to cover all the places the pings might have come from. "It's literally crawling at the bottom of the ocean so it's going to take a long, long time," Houston said. Despite the excitement surrounding the Ocean Shield's sound detections, Houston warned that the search had previously been marred by false leads — such as ships detecting their own signals. Because of that, other ships cannot be sent in to help with the underwater search, as they may add unwanted noise. "We're very hopeful we will find further evidence that will confirm the aircraft is in that location," Houston said. "There's still a little bit of doubt there, but I'm a lot more optimistic than I was one week ago." Finding the black boxes is key to unraveling what happened to the Boeing 777, because they contain flight data and cockpit voice recordings that could explain why the plane veered so far off-course. "Everyone's anxious about the life of the batteries on the black box flight recorders," said Truss, who is acting prime minister while Tony Abbott is overseas. "Sometimes they go on for many, many weeks longer than they're mandated to operate for — we hope that'll be the case in this instance. But clearly there is an aura of urgency about the investigation." The first sound picked up by the equipment on board the Ocean Shield lasted two hours and 20 minutes before it was lost, Houston said. The ship then turned around and picked up a signal again — this time recording two distinct "pinger returns" that lasted 13 minutes. That would be consistent with transmissions from both the flight data recorder and the cockpit voice recorder. The black boxes normally emit a frequency of 37.5 kilohertz, and the signals picked up by the Ocean Shield were both 33.3 kilohertz, U.S. Navy Capt. Mark Matthews said. But the manufacturer indicated the frequency of black boxes can drift in older equipment. Houston said the frequency of the sounds heard was considered "quite credible" by the manufacturer, and noted that the frequency from the Air France jet that crashed several years ago was 34 kilohertz. Pressure from being so deep below the surface and the age of the batteries can also affect the transmission level, he said. 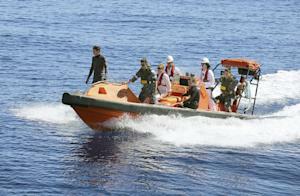 Meanwhile, the search for any trace of the plane on the ocean's surface continued Tuesday. Up to 14 planes and as many ships were focusing on a single search area covering 77, 580 square kilometers (29,954 square miles) of ocean, 2,270 kilometers (1,400 miles) northwest of the Australian west coast city of Perth, with good weather predicted, said the Joint Agency Coordination Center, which is overseeing the operation. Associated Press writers Kristen Gelineau in Sydney and Rod McGuirk in Canberra, Australia, contributed to this report.